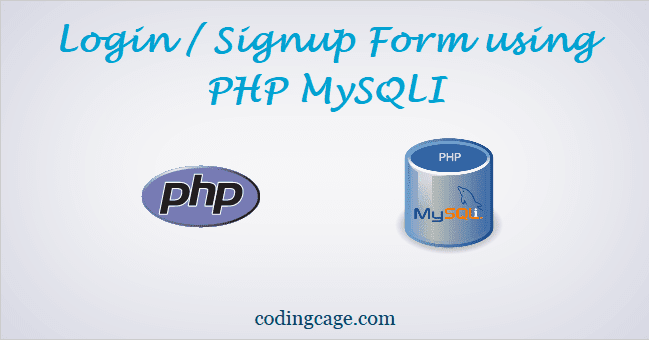 hello friends, we already have this tutorial but using MySQL extension but that's deprecated now and some users want it using MySQLi extension, so i have decided to post Login and Registration System using PHP with the improved MySQLi. it's a simple script which you can easily understand. for the designing purpose i have used here bootstrap to create login and signup form which is simple and easy to create with the help of bootstrap, if you are using PHP5.5 then you must use new password hashing function, you can see it how to use them here in this tutorial, Login script with MySQL so let's take a look. the database used in this tutorial is "dbtest" and the table is users, so create dbtest in your phpmyadmin and paste the following sql code to create users table. this file contains code for connection using MySQLi extension, here's how you can use MySQLi an improved extension with your MySQL Database. this is our registration/signup page for the new user and it will ask username, email and password to enter, i have skipped here validation part and used HTML5 required client side validations to validate the form and the form was created with bootstrap. password_hash($upass, PASSWORD_DEFAULT); it will make password stronger than MD5. <span class='glyphicon glyphicon-info-sign'></span> &nbsp; successfully registered ! <span class='glyphicon glyphicon-info-sign'></span> &nbsp; error while registering ! <span class='glyphicon glyphicon-info-sign'></span> &nbsp; sorry email already taken ! this is our login page which will ask users to enter email and password to go the home page which is members page, to use database we have to include "dbconnect.php" file. i have used here password_verify($upass, $row['password']) to verify password this is new password hashing functin and you have to use PHP5.5 to use this function. <span class='glyphicon glyphicon-info-sign'></span> &nbsp; Invalid Username or Password ! if user successfully logged in he will be redirected to this "home.php" page, this is members page only registered users can access this page, contains bootstrap header with menu and one link to logout. simple page to logout the users and redirects to the login/index page. it will destroys the current logged in users session. Need access to the bootstrap files. Unable to download the entire script. I registered successfully but when I try to log in ,I can see <>. Can you help me? Thanks. how to put this codes?? in dreamveaver? when i can find ...all the script ..without problems ? hi, i have an error in register.php. when i want to register another account, it said error while registering. is it have problem with the if($count==0)? because when i manually increase the user_id in database from 0 to 1 or 2(not 0), then it will display successfully registered. Do you happen to have a form like this but have a separate user and admin login ? sorry for the trouble with your code, please make sure you have created database table properly and comply with this code, or please try to echo insert query while signing up, you may there get your error. Hello, i realli like this script! I need to have it so that only users that have the "activated" value of 1 can view the home.php. Users who are not yet been activated will see a different page. Can you please implement this in the script or paste a line here that will make this work? Thank you in advance. Hello... How can i remove the hashing in it as i have to add my own encryption method. How do you set up style sheet again with this new script with style sheet? Hi, how do you style the login script again as like you did with the old code you publish? Worked for me! I just had to adjust the password to connect to phpMyAdmin on the dbconnect.php file. Thanks for the helpful code! I really appreciated this after looking for almost a week for something like this. if anybody want to make this script sucessfully without any error you must download wampserver 2.5 .
how to run the downloaded file? hello there, just download the code and put in your www directory then open the path in your , that's it ..
Hello Pranav, Now you can download the code, please go and download it..
Hi Girish, now you can download the code..
can i ask how do i make a profile page for the registered account they can update their info like name, age, gender, etc. Thanks Bro for a great tutorial.. it was very easy to understand and practice it. Thanks! Can I just say, it works (almost) out of the box for me and that's amazing! I was getting ready to put hours and hours into this to make it work, but it's so easy! Me too has been looking a long time for something like this. I like it - and it works, which is important. My problem is that I am not able to change from being directed to home.php after I have log in. In your earlier version and on xampp it worked with replacing home.php but not live with this version. Only get a blank page. I am a newbie and of course lack of knowledge. You can't only trust to escape strings. You must use prepared statements on your every sql connection. Even things like user login system, it's a must. Without prepared statements no one should use this codes. But thanks anyway, it rare to find login codes with new 5.5 functions. Ever had the problem where when logging in or registering it takes you to a blank page? Really appreciate the script, very helpful for beginners! However, I'm having an issue that I'm hoping you can help me with. The script is working fine, but when I try to "sign up" I am not redirected to any pages, and the new user isn't visible in the MySQL database table. I've opened the developer tools inside chrome to try and get a better look, and I'm not getting any console log errors. However, when I open up the network section I get the message "failed to load response data". I would greatly appreciate any help you can give me. Thank you very much for sharing your knowledge. I have never seen such easy-to-understand and usefull tutorial for php programing. Hello. I have the same problem. When i "sign up" i am not redirected to any page. It just resets the email and password and it stays on same page. Hey, it went all the fine, I was just wondering why is it giving default localhost P/w & E-mail instead of placeholder??? hi thanks for this tutorial but what if i want to check the username and email if its already taken? Able to register but cannot see login box, even after clicking the login link. It works fine with fastcgi, however doesn't work with suphp it will create a user account, but logging in with it takes you back to the login page without error if the password is correct, or with error if the password is incorrect. The fact that if logging in with the correct password doesn't give an error means it is indeed authenticating, but for some reason stays at login page. Even manually going to the home.php url after logging in kicks you back to the login page. Thank you for this awesome post. I have a little enquiry. I am creating a volunteer website. assuming I have a table with 10 rows; i.e user_id 1-10. How can I call the details of user_id 1 to show in the dashboard of user_id 2 and the details of user_id 2 to show on the dash board of user_id 1. thanks. If I do enter my email correct it doesn't matter what I type in the password field, it logs you in! You do have to enter correct email, but not the password. Same in my localhost, and I have tried in your host as well, same problem... Any fix for this?